Principal Michael Aronson (center) accepts a check on behalf of Polo Park Middle School. On Thursday, Jan. 31, Wellington Community Foundation board members Tom Wenham, Mickey Smith, Maria Becker and James Seder visited three local middle schools to deliver checks as part of the foundation’s annual “Our Schools” grant program. 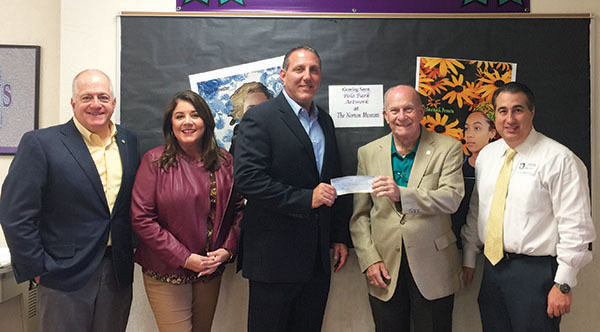 Checks totaling more than $5,000 were presented to Principal Dr. Eugina Smith Feaman of Emerald Cove Middle School, Principal Michael Aronson of Polo Park Middle School and Principal Blake Bennett of Wellington Landings Middle School. Each of the schools invited to participate in the grant program complete and submit an application that includes the needs at their school for underserved Wellington students. The WCF board reviews all applications and looks for information that will directly impact those students who attend each school that either have been or will face a hardship during the current school year. These hardships may be as simple as needing school supplies or as extreme as attending school while being homeless. This year, all three Wellington-area middle schools submitted grant applications and were approved to receive funds to cover expenses such as laptop computers and pay for a teacher to provide computer lab access before or after school for students who do not have computer or internet access at home so they can utilize academic programs. Approximately 100 students over the course of the school year will access the computer labs, as well as much-needed arts and craft supplies. The Wellington Community Foundation Inc. is a nonprofit charitable organization committed to benefiting the seniors, children and veterans in Wellington by supporting and improving their quality of life. For information about becoming involved in the foundation, or to make a donation, call (561) 333-9843 or visit www.wellingtoncommunityfoundation.org.